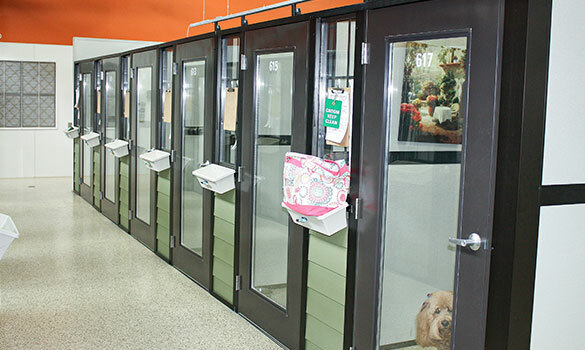 Pamper your pooch with our luxury overnight lodging accommodations. Your pet will enjoy between three and five hours of playtime per day which can vary due to weather conditions. In-room dining is available up to three times a day with fresh, cool water available at all times. 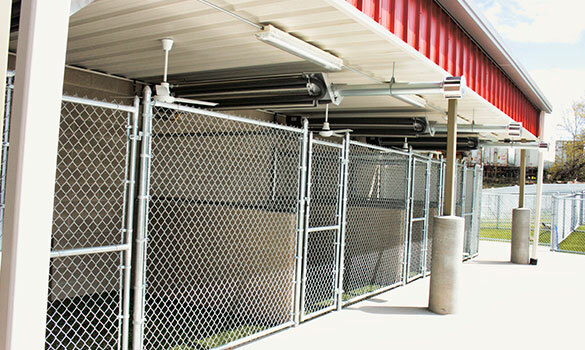 Our facility is fully climate-controlled for your pet's comfort. The Patio accommodation is the smallest room we offer. The room is 3’ x 5’ and generally in a high traffic area of the building. It is ideal for dogs that love to watch the world around them. The Suite is a generously-sized room that is 5’ x 10’. It offers a flat screen TV for background noise and keeps the comfort of home right here at the resort. 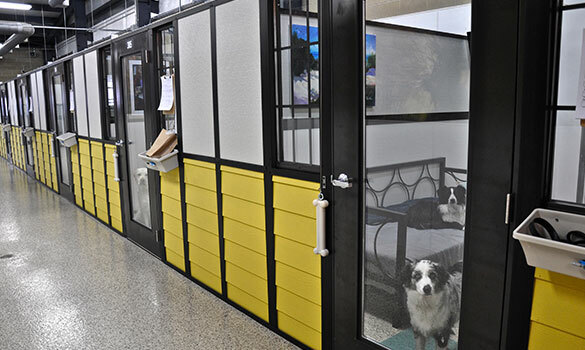 This room is ideal for dogs that would like a little more room to stretch out. 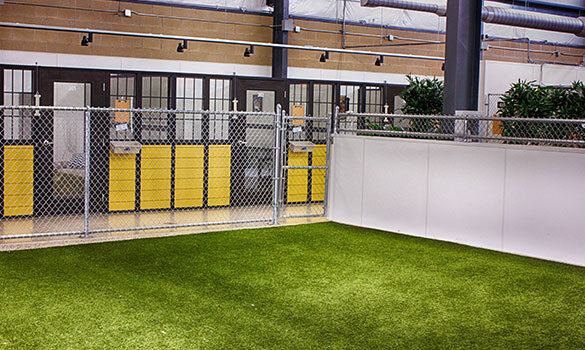 The Terrace Suite is reserved for dogs that are not interested in interacting with other guests or need a space away from the other dogs because they are nervous. These rooms are similar to the Suite, but they also offer a private 5’ x 10’ outdoor terrace that is heated in the winter and cooled with fans in the summer. 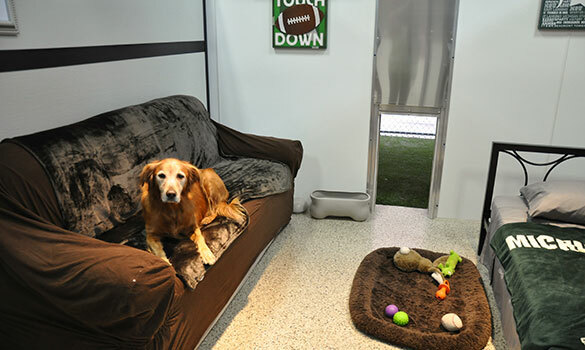 Dogs reserved in these rooms will not have the option of receiving group play. The Penthouse is our largest and most luxurious option. The room is 10’ x 10’ and equipped with a daybed, couch, and a flat screen TV. The outdoor terrace is an additional 10’ x 10’ of space, heated in the winter, and cooled in the summer with a personal ceiling fan. 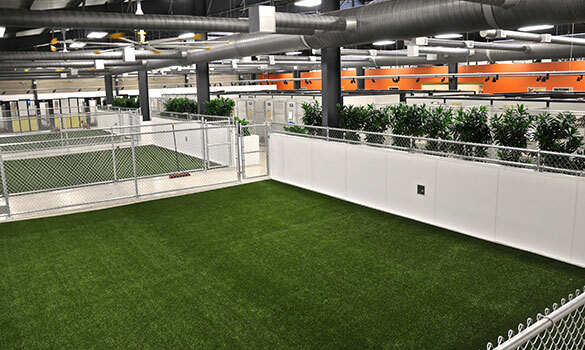 Dogs reserved in this room will enjoy their own private terrace, plus have the option of group play. There is a 2-night minimum stay for this room and a deposit is required. Please see a staff member if you are ever in a situation where your dog may need a little extra TLC during their stay. 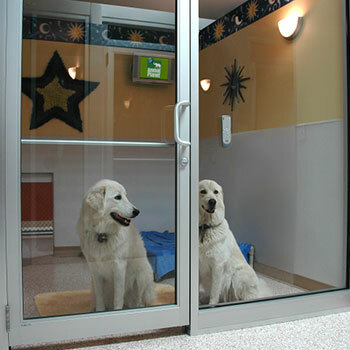 These rooms are specifically designed for dogs that have health issues or are recovering from surgery. Pet parents can choose to feed their dog our house food (Iams Adult Dog Food - Green Bag) or they are welcome to bring their own food from home. We ask that any food brought in for a boarding stay is pre-portioned into individual baggies (Breakfast, Lunch, and Dinner). 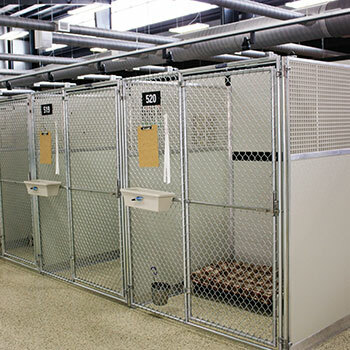 If food is not portioned at the time of check in, there will be a $10 service fee per dog charged to the boarding stay. Our standard check-in time for boarding is anytime after 2:00 pm and our standard check-out time is anytime before 12:00 pm. Scheduling an early arrival or late departure will result in a $20 fee per room. If a boarding package is purchased this fee will be waived but an accurate arrival and departure time is still requested.